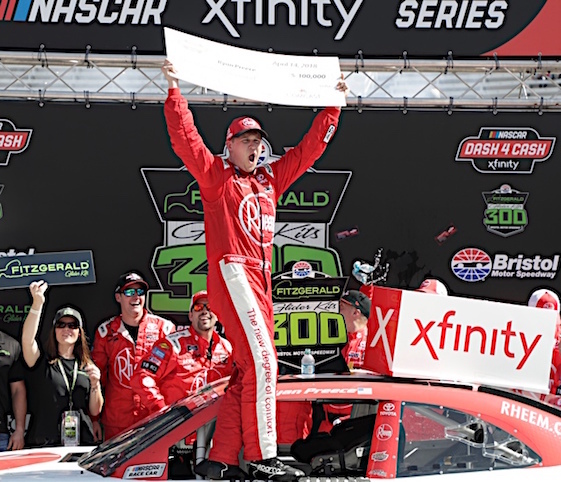 Ryan Preece won Saturday’s NASCAR Xfinity Series at Bristol Motor Speedway. Preece’s led 39 of 300 laps in his Joe Gibbs Racing Toyota to collect his first win of the year, the second of his career and his first in the series at Bristol. Preece collected an extra $100,000 Dash 4 Cash bonus for getting the win. Justin Allgaier recovered from a Stage 1 incident and wound up second in the JR Motorsports No. 7 Chevrolet. Daniel Hemric, Elliott Sadler and Spencer Gallagher completed the top five. Brandon Jones finished sixth after leading a race-best 106 laps.